I was recently asked to take the following photo and replace the fly rod in the hands of the sportsman in the front of the canoe with a rifle. 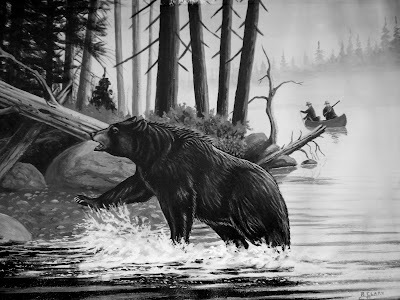 With a little bit of cutting, pasting and erasing I was able to edit the photo and place a 30-30 Marlin into the hands of the guy in the front of the canoe. As an interesting side not the image of the 30-30 was a drink stirrer I found at "camp" photographed and them edited down to size. Interesting! It is fun to be creative once in awhile and challenge your self. Good job. That's pretty slick! Nicely done. Nice job, I am horrible with photoshop....no patience! PM, AND just how did you know that I wonder! LOL!